Well ladies and gentlemen, this is the official first post of my new blog. 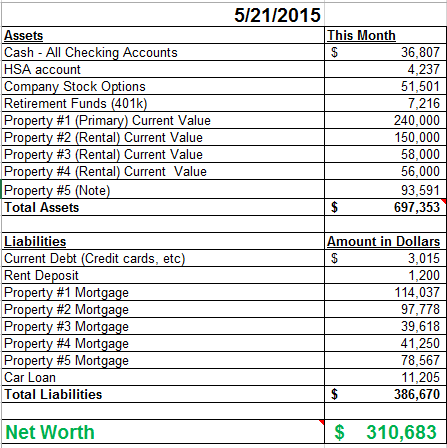 Below are my actual numbers for ALL my investments and liabilities as of today. Explanations below chart. This constitutes two different checking accounts. My normal checking account and my REI (Real Estate Investing) checking account. My intentions is to not keep this balance so high. The reason why it is high is because a big chunk of that is about to go to pay a 25% down payment on a new rental I’m currently in the process of buying. As of now, this number is good to me and I’m satisfied with it however ultimately I need to figure out a way to save more of cash from all the income I get. I feel like I spend too much. Now that I will start tracking all of this it should help me with this problem. Satisfied! These are stock options from my day job. I am fully vested. This number goes up and down but for the most part has been consistently going up. I’m anticipating on these stocks to continue to grow however its pretty much all speculation. Educated speculation at least. Satisfied! I have made an executive decision to no longer contribute any more money to my 401k or lack there of. Mainly because I do not get matched contributions from the dreadful day job. But also because I KNOW i can make better returns using that money on rental properties. I expect this small investment to gradually grow each month. Satisfied! This is my primary residence. The market I live in is extremely hot and I expect the appreciation on this house to continue to grow. I will only update the market value once a year though with the next time being spring of 2016. I have it listed as a conservative $240k right now based on MLS comparisons in my neighborhood. If I were to sell it im pretty sure I could get at least 250k for it but ill stick with 240k for the spreadsheet to be safe. Satisfied! Here are more details on this future investment property. This is my first rental property. It used to be my primary residence. I expect gradual appreciation from this property as well because it is in the suburbs of this HOT market I live in. Love me some HOT markets! 150K is about what its worth now based on MLS comparisons. I will update the market value of this property in the spring of 2016. Rent paid in full and on time. Just did a lease renewal on this property for a year. Also spent $15 on a new porch light, about $6 on a gutter fix and $6 on two new air filters which I purchased for the tenant. Satisfied! This is my first turnkey rental property I purchased out of state. I do not expect much appreciation on this property. I purchased this for CASH FLOW purposes only. Rent paid on time. No repairs. Satisfied! This is a note that I own from a house that I sold via owner finance. Mortgage paid on time. No issues. Satisfied! These are self explanatory so I wont dive too deep into these however I would like to include the items below for informational purposes. I only use one credit card (rewards card) that I use to purchase my everyday expenses. I pay this off in full every month. This number will change each month and really only shows up on the spreadsheet because I dont pay off the card until the end of the month and I am tracking my net worth numbers just before that. I purchased this vehicle before I had the proper knowledge on how to be totally awesome with finance and investments so that is the only reason why I have this loan. If I knew then what I knew now, i would have purchased a used vehicle all cash. 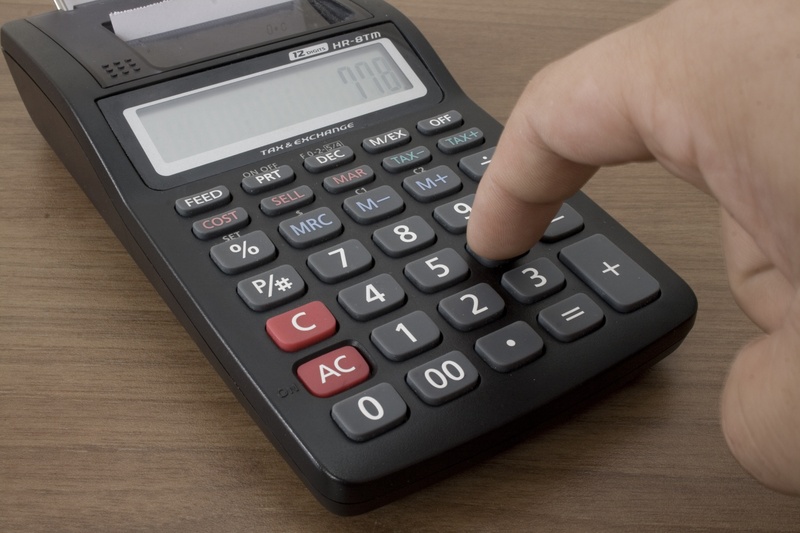 It is not worth it to me to pay this loan off because the interest rate on this loan is 2% and I would rather use that money to buy more rentals where I will make a much greater return. To setup and track your net worth online, create a free account Personal Capital . Wow! I’m impressed with all of your rental properties. We hope to begin stockpiling cash this year to possibly purchase an investment property next year. Great work! Thanks so much! I appreciate the comment. 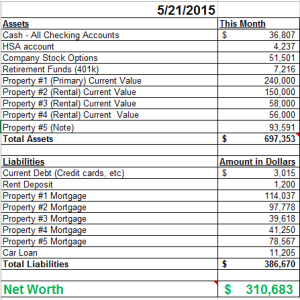 The cash flow I get from rental properties is going to be what I retire from some day so its vital I keep building. 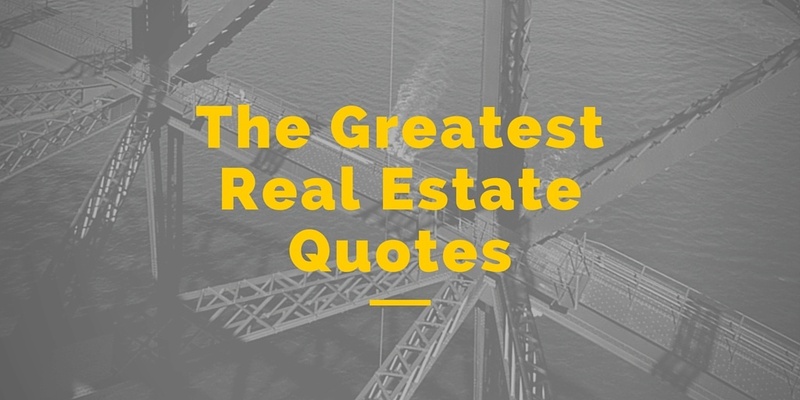 I think it would be a very wise decisin for you to purchase an investment property. Keep me informed if you do. I would love to hear all about it and if you have any questions about any of it, feel free to send me a shout. I would be more then happy to answer any of your questions. I really like your blog too by the way! This nice I noticed you are writing a lot about real estate and I see why. 5 properties that sounds like a good portfolio. I want to get into real estate also but we aren’t ready to make the jump yet so we are just doing stocks. Do you frequent Bigger Pockets website? Hey Roamer, I appreciate the comment. Thanks so much! Yeah I just wish I had 20 properties, that would be more then enough for me to finally quit the rat race. I hear you on not being ready to make the jump yet. Its very scary diving into real estate with out anyone holding your hand. That is exactly how my first experience was when I bought my first investment. Im in the same situation as you regarding stocks. Im not quite ready to dive into that platform yet but I need to read up. For now I will keep building my rental properties. If you ever need any help or advice on real estate feel free to send me a shout. I like your blog, it has a lot of helpful content. No contributions to your 401K? Is that still the case? I’m going to have to read all your blog posts to find out. Don’t you feel the need to shelter some of your income from taxes? I’m not very familiar with real estate investing, but I would be curious if you could use the 401K money to invest in real estate once you leave your day job. Oh yeah, that is still the case. As long as im not getting matching contributions I just think I can put that money to better use. Plus I dont like the fact of getting penalized to take out my own money if I ever need to. As for taxes, If i can find a better way to shelter my money I will but I am just anti 401k at this point in my life. Awesome! 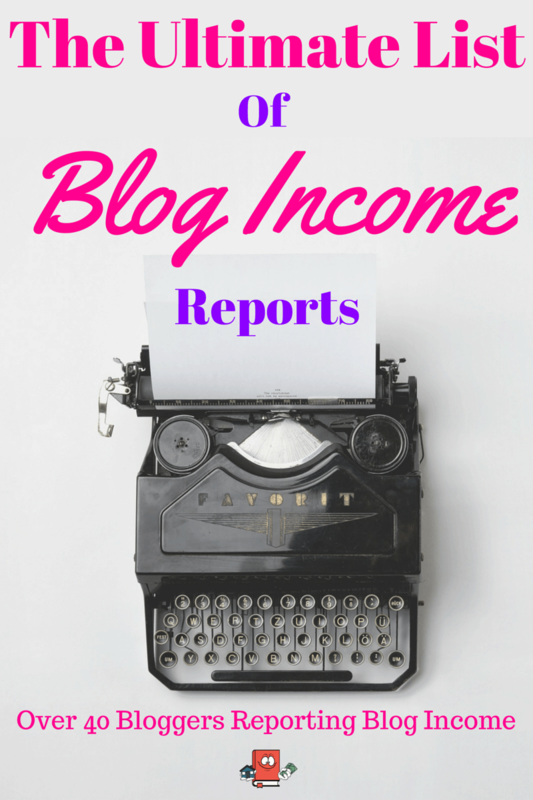 you are very transparent on sharing your income report. I’m very inspired by your income and will also plan my financial strategy like you.